In an incredible show of solidarity and strength, well over 3,000 MPS education workers, parents, students, and community members picketed up and down Vliet Street outside of MPS Central Office. Quickly, the crowd grew so large that Vliet St. was closed as the picketers spilled into the street and took over 5 city blocks. Neeskara and Sherman Elementary school nurse Maggie Mitchell’s sign points out the inequities Milwaukee Public School students face. MPS students are worth thousands of dollars less per pupil in the eyes of the state’s funding formula when compared to their surrounding suburban counterparts. This means nurses have to purchase their own band aids and other materials students need (Photo credit: Joe Brusky). Workers from all over the city joined the picket. Unions representing transit workers, healthcare workers, electrical workers, communication workers, postal workers, auto workers, delivery drivers, and museum workers all came out to support MPS students and educators in our fight for a fair budget. Many groups representing making up the pro-public education Schools and Communities United coalition were also present. Educators from Madison, Racine, Kenosha, and the greater Milwaukee area also came out in support. Massive 24-foot parachute banners were unfurled and carried by the crowd. Parachute banners painted with messages were walked on the picket. Parachute on left: “Community Schools Build Democracy (with “I Matter” photo. Parachute on the right: “Public Education the Heart of the Community (Photo credit: Joe Brusky). Students and adults alike run underneath the parachutes as they are lifted up into the air (Photo credit: Joe Brusky). The picket was so large, MTEA President Kim Schroeder and Vice President Amy Mizialko climbed up on the roof of the union office to address the crowd. Their message was simple: These cuts are an attack on every MPS student and education worker in this district and we will reject any budget that does further harm to our schools. It doesn’t have to be this way. MPS has a billion dollar budget, and cuts can and must be made farther from the classroom. The proposed MPS budget cuts are so bad teachers are being told they need to purchase paper for their own classrooms next year. “Specials” refers to art, music, and physical education classes in MPS (Photo credit: Joe Brusky). A Neeskara School parent with her children highlighting the much-reduced schedule of art, music, and physical education classes in MPS (Photo credit: Joe Brusky). Click here for more photos from the picket. To cap off the evening, our entire line headed towards the front door of central office. The doors were locked despite the public school board meeting that was to be held inside. Picketers began knocking on the locked front doors and chanted, “This is a public meeting, let us in!” When the doors were finally opened a loud line of educators, parents, and students streamed through the hallways, chanting to remind the MPS Administration and School Board of our demands. “This is a public meeting! Let us in!” chant outside MPS Central Office (Photo credit: Joe Brusky). Youth Empowered in the Struggle students lead chants inside Central Office and outside the school board meeting (Photo credit: Joe Brusky). Chanting through the halls of Central Office (Photo credit: Joe Brusky). Even the Rufus King drumline joined in. Our action yesterday showed our strength and demonstrated our commitment to our students. We will continue to fight against cuts that hurt students and education workers. Here are key dates and events for you to remember as we fight back cuts to students and educators. Further actions to come to WIN for our students! Educators Must Fight for Our Students and Lead the Way Forward! Photo of textbooks in an MPS classroom (Photo: Joe Brusky). Milwaukee Public School students and classrooms have been systematically defunded. Tattered textbooks, crowded classrooms, and shrinking art, music, and physical education classes are just a few of the consequences our students and educators face thanks to Scott Walker’s unprecedented public education cuts. In addition to Walker’s cuts, MPS students also face a structural disparity in per pupil funding when compared to their suburban counterparts. MPS administration has for too long accepted and passed these cuts on to our students and classrooms. Top this with the fact administration continues to entertain toxic proposals from privatizers that will hand over our schools to private operators. Enough! When will administration put their foot down and demand better for our students? Riverside High School students and educators rallied and walked in together on Tuesday morning to call attention to the cuts (Photo: Joe Brusky). Now MPS is proposing an additional 5% across the board cut to students and schools and massive healthcare and benefits cuts to the same education workers already burdened by years of cuts. MPS educators have stepped in to fill the void left by state budgets by purchasing snacks, clothing, and basic classroom supplies for their students, but our students deserve fully funded classrooms, not charity. We’re tired of our Governor, other politicians who refuse to act, and an MPS administration who continues to pass cuts on to students and classrooms. We’ve had enough and we’re fighting back! Over 1,500 educators, parents, and community supporters packed MPS Central Office on Tuesday to demand a better budget. Last Tuesday, the MPS Central Office auditorium, three overflow rooms, and hallways were filled to capacity with educators, parents, and students to demand a better budget. Many MTEA and community members as well as students spoke out against the proposed cuts. To download the April 24 sign up sheet, click here. Riverside Rallies & Walks In to Say NO to Massive Budget Cuts to Students & Schools from MTEA Union on Vimeo. Obama School of Career and Technical Education student and Milwaukee March for Our Lives organizer Marvell Reed holds a sign at a press conference at Homestead High School announcing the day and time of the march (Photo credit: Joe Brusky). Since the mass shooting at Marjory Stoneman Douglas High School, in which 14 students and 3 educators were killed and 14 others were wounded, students and educators have been the most outspoken advocates for ensuring that all students have the support to learn, starting with school communities that are safe from gun violence. A student works at the Milwaukee Art Build for Public Education that took place in the Riverwest neighborhood and ws organized by MTEA members last February (Photo credit: Joe Brusky). Milwaukee Teachers’ Education Association members are organizing a Saturday of art to fight for schools that are safe from gun violence. We choose our students, not guns. The Art Build will take place Saturday, March 17 from 10:00am-6:00pm in the art ed. room in the basement of the UWM Kenilworth Square Building. Students and educators from MPS are encouraged to submit designs for either the poster or the banners. MTEA is sponsoring this one-day art build. 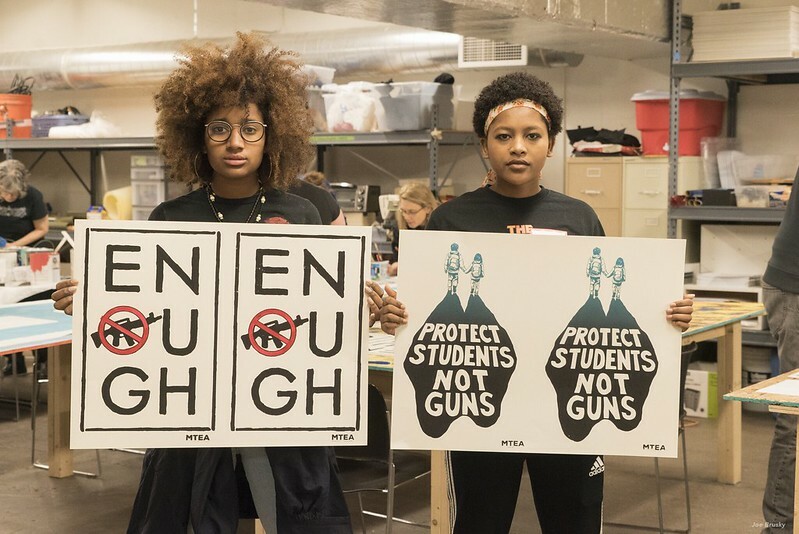 The plan is to screen print 2,000 posters with the message: “Protect Students, Not Guns” and to paint banners with the slogan “Never Again.” Students and educators from MPS are encouraged to submit designs for either the poster or the banners. • Leave space in the lower right corner for the MTEA logo to be added. • Things to consider: Bold designs, bold images, bold text are best read in a crowd and by the camera. • Banner designs will be projected and painted. • Banners will be horizontal compositions. Around 4′ tall by 8′ long. • Banners will be painted so best if the design is 1-3 colors max. Bold designs, bold images, bold texts are best read in a crowd and by the camera. Milwaukee public School teacher Ingrid Henry-Walker had her microphone cut and was escorted out by security for expressing her opinion at a board meeting Tuesday night (Photo: Joe Brusky). Public school districts are strongest when they collaborate and work together with parents and community members. To facilitate a healthy and democratic school district, school board meetings need to be accessible to the public and allow for constructive criticism. The uptick in reports of publicly elected school boards restricting citizen comments is disturbing. Taxpayers should be able to openly criticize school district decisions, whether it’s a policy around recess, raises, or rent. Public voice should be heard and valued. This week a video of Louisiana teacher Dayshia Hargrave went viral. Hargrave was speaking at a local school board meeting when her testimony was abruptly cut off and a law enforcement officer aggressively handcuffed her. Her violation: questioning the superintendent’s raise while other district educators had their pay frozen. Louisiana teacher Dayshia Hargrave was violently handcuffed and arrested for simply expressing her opinion at a school board meeting. A similar scene played out in Milwaukee on Tuesday night. Ingrid Walker-Henry, a Milwaukee Public Schools educator and the co-chair of a local coalition advocating for public schools in Milwaukee, testified against a lease extension for a private MPS charter school. While the committee chair, Michael Bonds, allowed off-topic and unsubstantiated testimony from supporters of the private charter, he abruptly cut off Ingrid Walker-Henry’s mic for speaking too broadly about the need for fair market lease rates on private charters that use public buildings. Once her microphone was cut, Walker-Henry turned to the crowd and used her teacher voice to finish her testimony before she was escorted out of the building by district security. “We are calling on MPS to be more responsible with taxpayer dollars. There needs to be a fair market value lease rate that is charged to privately owned and operated charter schools. School Board Minutes from 2006 reflect that MPS once had a board approved charter rate of $12/square foot. The current lease for Carmen Northwest is less than half of the 2006 board recommendation and some of the other charters come in at even less. This raises serious concerns about the way you negotiate leases with private operators. • The original leases approved for Universal in 2013 were for 5 years. Green Bay paid roughly $400,000 per year, Webster $380,000 per year and the Lee campus was for just $101,000 a year. • In April 2016, the board actually lowered the lease rates for two Universal locations for the 2016-2017 school year. • And as we all know, Universal DID NOT operate its fifth year in 2017-2018. They turned in their keys and abandoned some of the most economically disadvantaged students in our city. As a result of Universal’s failure, the district only received approximately $1 million total from each school, about half as much as the lease was for. • The closing of Webster cost the district an additional $1 million. Democratic school boards have a moral obligation to provide a forum where local citizens can give meaningful input, both positive and negative, about the actions of the district. MTEA President Kim Schroeder speaks to a crowd outside the Milwaukee Joint Finance Committee public hearing on the two-year state budget, where overwhelmingly public education supporters demanded a per pupil increase for K12 funding (Photo credit: Joe Brusky). MILWAUKEE – June 6, 2017 – Today the Milwaukee Teachers’ Education Association (MTEA) president, Kim Schroeder, released comments on Assembly Republicans’ alternative budget proposal that would cut $90 million from the Governor’s already modest K-12 budget and reduce the per pupil funding by $50 per student. “Since Walker’s Act 10, Wisconsin students have experienced the greatest cuts to public education since the great depression. The decision to disinvest in public education has resulted in severely understaffed and under-resourced schools, not just in Milwaukee but across the state. From Milwaukee to Shawano, educators are supplementing a significant portion of their classroom materials with funds from their own pockets. “Wisconsin students and educators cannot suffer one more cut. In a district with over 75,000 students, reducing the Governor’s budget proposal by $50 per student would result in $4 million less to spend on resources that have a direct impact on our students. “All children have the right to attend fully funded public schools with professional educators, class sizes small enough for one-on-one attention, libraries, safe playground equipment for recess, current technology and textbooks. Every Wisconsin student, regardless of their zip code, needs Wisconsin legislators to commit to at least $200 in per pupil. For over 50 years, the Milwaukee Teachers’ Education Association has been a champion for public education in Milwaukee. The Milwaukee Teachers’ Education Association represents over 4,600 educators and support personnel who make Milwaukee’s public education system possible. MTEA, an affiliate of the National Education Association and is the largest educator local in Wisconsin. Learn more at mtea.weac.org. Statement from the Wisconsin Public Education Network (WPEN) can be found here. Public education advocates painted a banner in February calling for the full funding of public schools in Wisconsin (Photo credit: Joe Brusky). The fifth and sixth grade students at Craig Montessori School made posters and banners for a Peace March outside school on Monday afternoon. The students waved their signs for passersby to see in an effort to bring attention to violence in the city of Milwaukee. Thanks to teacher Kenneth Spears and MTEA member and teacher Christina Disterhaft for helping facilitate this important action with your students! Flickr album with photos from the Peace March can be found here. 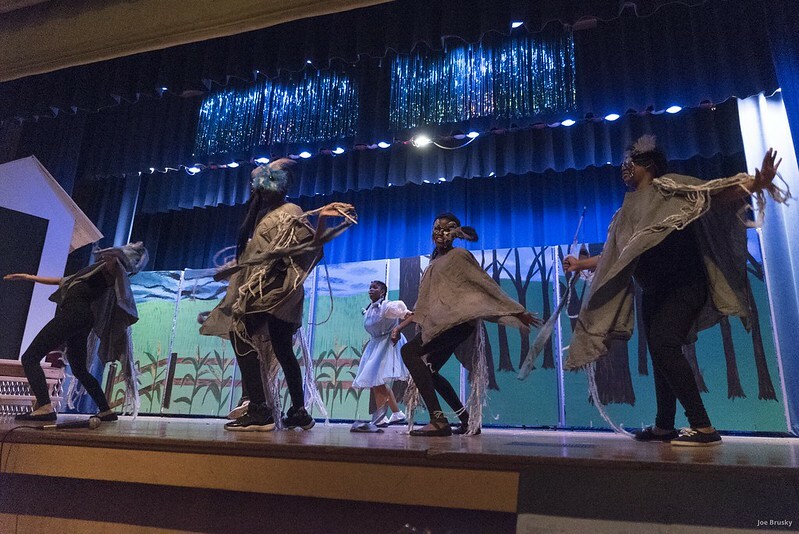 Students from Rufus King Middle School, Golda Meir, and Story Elementary are performing in “The Wiz” this week at RKMS (Photo credit: Joe Brusky). Classrooms from around MPS were treated to a brilliant performance of “The Wiz” Wednesday morning at Rufus King Middle School. The students of RKMS, Golda Meir and Story Elementary collaborated to make it happen. Check out these photos from their performance. There will be a public showing on Friday at 6pm at Rufus King Middle School. Tickets are $5.00, and can be purchased at the door (121 E. Hadley Street – enter on the Palmer Street entrance). Please come out and support the Rufus King International Middle School Generals, Golda Owls and Story Gators. This is what collaboration looks like! Milwaukee Public Schools has been getting some well-deserved attention for its commitment to the Community Schools model–which has grown from the advocacy of educators in the Milwaukee Teachers’ Education Association. The district established the first three community schools in 2015 and has now expanded to a total of seven thriving community schools. Early growth shows improved school culture and climate, significant increases in literacy rates in early grades, dramatic growth in school and community partnerships, increased math proficiency in early grades, increased community engagement, and increased college and career pathways for students. Authentic Community Schools link culturally relevant classroom practices with community services, social supports and neighborhood engagement. The Center for Popular Democracy identifies six research-based strategies that allow for greater student-centered learning and community investment. These strategies include: strong culturally relevant curriculum, high quality teaching; shared leadership; community support services; restorative practices; and family and community engagement. 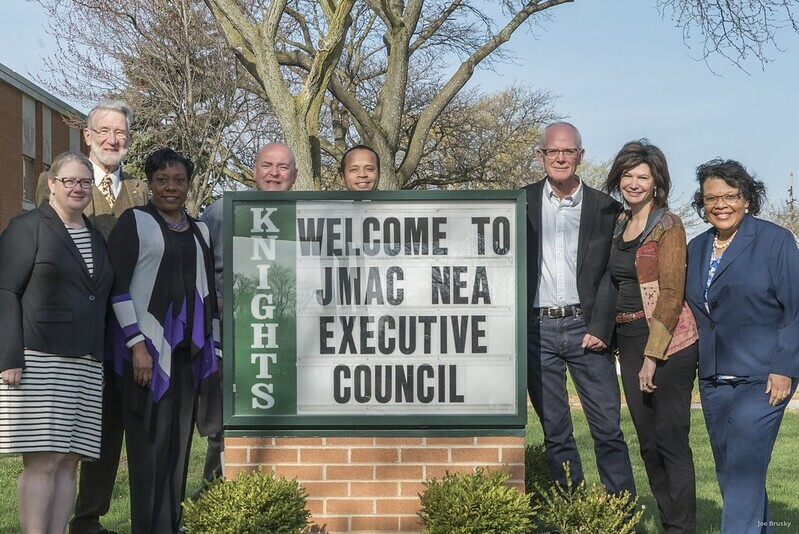 Milwaukee’s early success with the model prompted National Education Association (NEA) President Lily Eskelsen Garcia, Vice President Becky Pringle, and Secretary Treasurer Princess Moss and members of the NEA Executive Council to visit. NEA’s trip signals the growing interest to strengthen and build the public Community Schools model nationwide. The visit started with a trip to James Madison Academic Campus (JMAC), where the MPS Administration shared successes and challenges with implementing the Community Schools model. NEA President Lily Eskelsen Garcia and her leadership team sit at the table with MTEA leadership and MPS Administration to discuss Community Schools in Milwaukee (Photo: Joe Brusky). JMAC’s Community School Coordinator and Parent Coordinator provided their expertise to the group. These two positions are critical to establishing engaged parents and community for successful school outcomes. The Community School Coordinator for James Madison Academic Campus (JMAC) presented to the group (Photo: Joe Brusky). Following the visit to JMAC, the group made their way over to the newest Community School in Milwaukee, Lincoln Avenue, where the school’s “Lincoln Cheer Team” greeted them. The Lincoln Cheer Team greeted the group upon their arrival (Photo: Joe Brusky). Beck Pringle and Lily Eskelsen Garcia react to the festive welcome (Photo: Joe Brusky). Lincoln Avenue’s parent coordinator showed off the school’s Parent Center. The center provides a hub for parents to increase engagement in the school’s operation as well as expand access to needed resources, such as Internet and laundry facilities. Lincoln Avenue’s Parent Coordinator shares the early successes with the Parent Center at the new Community School (Photo: Joe Brusky). Ryan Hurley of the United Way of Greater Milwaukee and Waukesha County spoke on how his organization facilitates community partnerships by helping identify and mobilize neighborhood groups and resources. These neighborhood collaborations provide the school with additional support such as access to health services or other critical needs that must be met to ensure learning occurs. Lily Eskelsen Garcia observes a reading group (Photo: Joe Brusky). Finally NEA leadership got to see the model in action. They toured several rooms, including a bilingual kindergarten classroom. Lily Eskelsen Garcia, Becky Pringle, and Princess Moss used the opportunity to work and speak with students to experience how students are excelling. The early results on the Community School model are encouraging, but there’s no greater proof of the model’s success than seeing students thriving firsthand. We know when our students’ needs are met they flourish. NEA Vice President Becky Pringle checks in on a young writer (Photo: Joe Brusky). As the model grows nationwide, we look forward to making Milwaukee a place for other NEA educators to come and learn about how the model can enhance the quality of classroom practices and increase community involvement. Public community schools galvanize our educators around a vision inclusive of community control of public education which stands in stark contrast to the corporate destruction of our public schools system. Lincoln Avenue students ask Lily Eskelsen Garcia and MTEA Vice President Amy Mizialko take a photo as they left the school (Photo: Joe Brusky). Learn more about Community Schools here.